DVD Author Plus's user interface has a user-friendly design that provides easy access to all functionality. All the functionality of DVD Author Plus can be accessed from the Menu Bar. 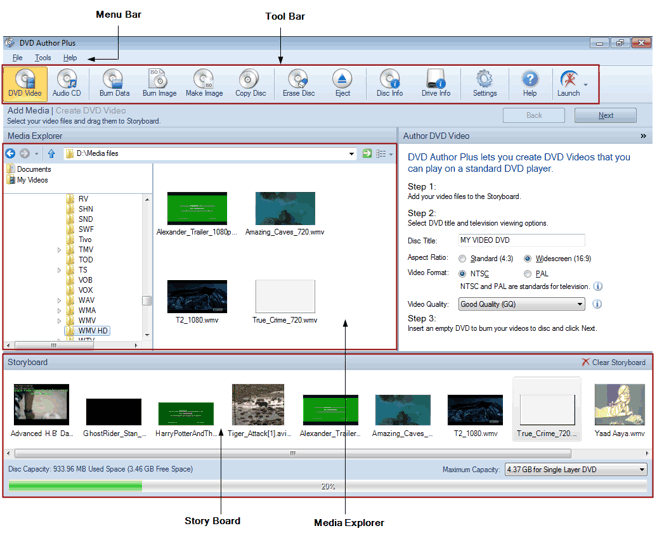 The Tool Bar provides easy access to some of the most often-used features of DVD Author Plus. This lists the files and/or videos used on your Data, Audio, or Video discs. The storyboard is a graphic organizer that displays thumbnails of the files that you add. You can drag the files from the Media Explorer and drop them to the storyboard.